This southwest corner waterfront unit has spectacular views from every room. You can look down into the water, see wildlife, bridges and sunsets. There are accordion style hurricane shutters surrounding the balcony for protection and shade. 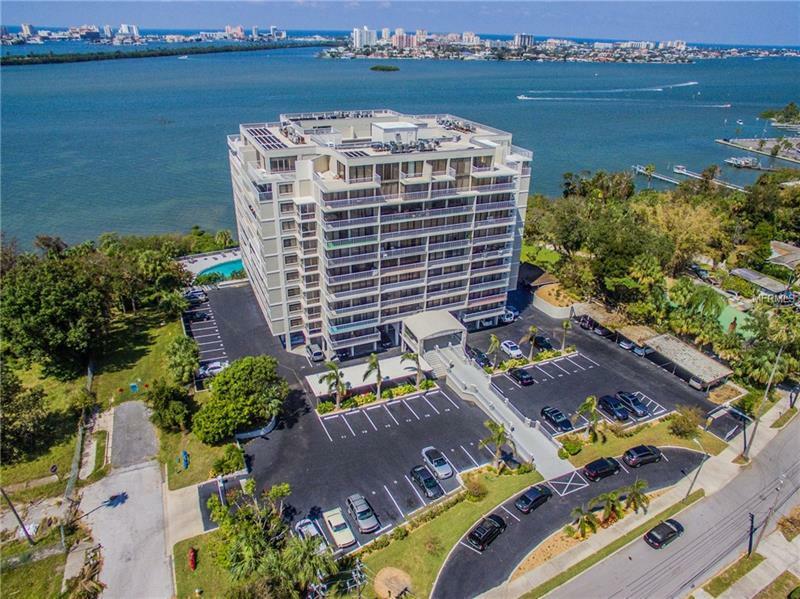 As part of a waterfront complex that is located adjacent to downtown Clearwater to the north, it is convenient to the world-class beaches, downtown and easy access to US 19 shopping and airports. Aside from being fully gutted and renovated in the mid-2000's, the real beauty and value is the views. There are built-in cabinets, desks & shelves, stainless steel appliances and ceramic tile. Note: cats/birds allowed but no dogs; leasing okay after first year of ownership one time per year, with a six-month minimum lease when the building has not reached its rental unit limit. This atrium style building provides openness and has been well-kept up. Take advantage and make offer. Please Note: Buyer or a member of Buyer's family must plan to reside in the unit at least 50% of the time for the first 2 years. This is due to Seller requirement as a foreign person. Pet Restrictions: No dogs. Cats, fish and birds are allowed.